Here is the scenario: you have a source file with a class and some methods, and then you think it is a good idea to do some cleanup. You know, sort the methods in visibility order (public first) maybe create a subclass to wrap some functionality together, or place methods close to each other depending on how they are called, just to improve readability. So, here is the deal: shouldn't we try to keep the code as clean as possible? Yes, of course, sticking to whatever common style rules the team agreed to stick to. But then, in real life, isn't it a merge killer? Well, I'm using a clone of Kestrel Server source code and more specifically working on file MemoryPool.cs. Base is how the code was originally (in fact, the figure is hiding all the methods not involved in the example, the code is slightly more complicated than that). Source (src) and Destination (dst) are the changes that the two developers are going to make. Look at the icons: C stands for "changed" and M for "moved". As you can see both methods will be changed concurrently (C on both sides) and also moved by one of the developers. This figure is actually taken from SemanticMerge. Needless to say, "traditional" diff is not very helpful with moved code. To create the actual conflict, I used two branches: task001 where I was doing the refactor/reorganization of the file, master where I just modified the methods. And, as expected, Git detects a conflict on MemoryPool.cs. Solving it with SemanticMerge will be simpler than it seems. Just run git mergetool (provided you configured Git to use SemanticMerge as its merge tool, which is quite simple to achieve (see how to make it). The key issue you face when trying to merge code that has been moved is that traditional merge tools are not "code aware". They don't parse the code, and as such they just try to match lines that are close. But, that fails when the methods are reordered like in this case. There are only 2 conflicts to solve. Remember, only 2 methods were changed. The tool starts with the first conflict, Dispose() in this case. 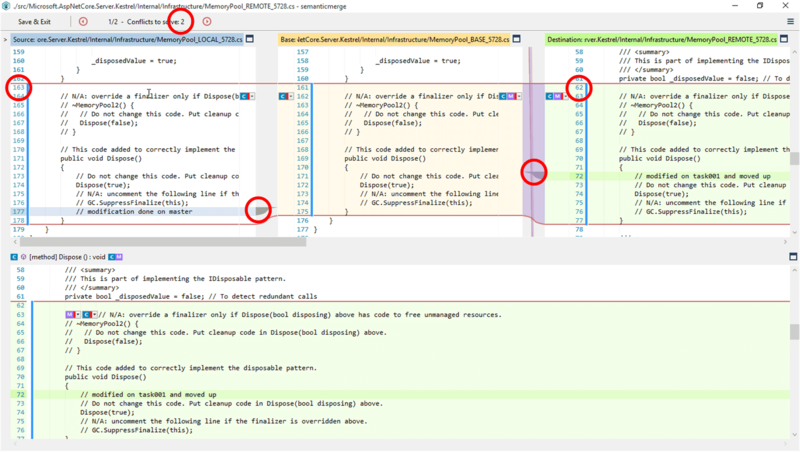 Check how the 3 versions involved are aligned on the Dispose() method. I mean, check the line numbers. Remember Dispose() was moved up and changed, and modified in the original location by the other developer. SemanticMerge detects the conflict, but also shows it in a way that is easy to understand. Traditional "line sync" is broken to sync on actual methods. Finally, check line 177 on the left and 72 on the right. These are the actual changes made to the method. You also see the C and M icons on the method declarations. There are dropdowns there to let you run the merge of the Dispose() method. It will be an automatic merge since the lines are not colliding. And, the same will happen for the Return() method that was moved down. Git does a great job calculating the 3 contributors (base, yours and theirs) involved on each file merge. It implements merge tracking to do that, it calculates the common ancestor and then asks an external tool to handle the job when there are manual conflicts (conflicts its algorithm can't figure out without manual intervention). By plugin Semantic to Git, you extend the "merge power" you are used to inside the files. And since location dependent conflicts are no longer a conflict, cleaning up code and reordering methods are not the root of all merge evil anymore. But all of this works just "inside" the same file. What we really need is a merge tool that tracks moved code across files! - I hear you say. Yep, that's correct, but we need to develop our custom merge driver for Git to do that. Something we will definitely do, so stay tuned. If you want to download the tool and give it a try, just go to www.semanticmerge.com.